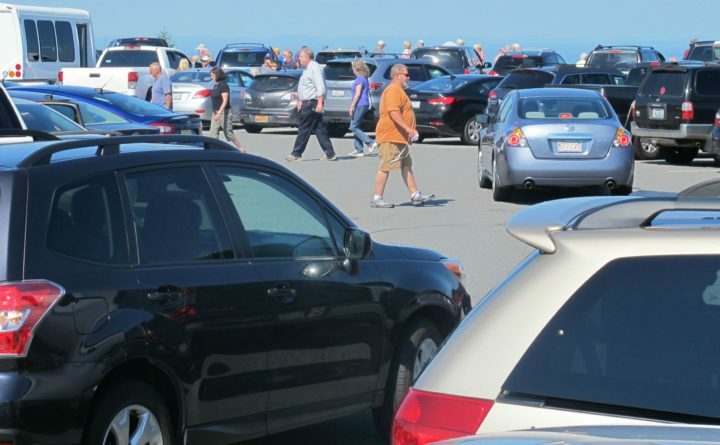 Cars and pedestrians crowd the parking lot at the summit of Cadillac Mountain in Acadia National Park in this 2015 file photo. A new traffic management plan for the park, the final version of which Acadia officials released on Monday, calls for creating a vehicle reservation system for congested areas of the park. Park officials expect to begin implementing the plan in 2020. After working for the past few years on ways to manage increasing traffic in Acadia National Park, park officials on Monday released the final version of Acadia’s new traffic management plan. The plan, which requires National Park Service approval, is expected to create a vehicle reservation system at certain times for high-traffic areas in the park. This and other new aspects of the plan are not expected to be implemented before 2020, though it may take a few years for the new plan to be fully implemented, according to park officials. Parts of the park that will require vehicle reservations at certain times include the summit road on Cadillac Mountain, Ocean Drive between the entrance station at Schooner Head Road and the Gorham Mountain parking lot, and the north parking lot at the Jordan Pond House — all of which have been known to become very congested at certain times of day during the park’s busy season in summer and fall. The popularity of the top of Cadillac Mountain, where traffic can be especially busy around sunset each day, typically results in the summit road being shut down several times each summer to allow for departing traffic to alleviate crowding at the top. If warranted, other parts of the park also could be added to the reservation system if “traffic or resource conditions are worsening beyond acceptable thresholds,” according to the executive summary of the 282-page plan. — Phasing out right-lane parking over the coming years as other options, such as expanding the Island Explorer bus service and adding more parking at the Hulls Cove visitor’s center and the Acadia Gateway Center in Trenton, are implemented. — Constructing a new parking area for Eagle Lake off Route 233 at a park maintenance storage yard known as Liscomb Pit and removing the existing parking lot and restroom on the north side of the road. — Constructing a new visitor’s center with expanded parking in Hulls Cove. — Fully removing parking and other services at Thompson Island, at the causeway from Trenton to Mount Desert Island, after building the planned Acadia Gateway Center in Trenton. Many details of how the changes will be implemented, such as the design of proposed new facilities, have yet to be worked out and will be subject to public input before they are fully designed and put in place, Acadia officials said. David MacDonald, president of Friends of Acadia, said it won’t be easy to put many of the changes in place, but that the nonprofit group is ready to help with additional planning, funding and implementation efforts. Correction: An earlier version of this story cited the wrong landmark in identifying where car reservations will be required along Ocean Drive.